Many types of Jewish breads have become widely popular throughout Europe and the United States, including the bagel and the sweet, eggy Challah bread. Some types of Jewish breads are traditionally associated with specific holidays; others have long been consumed year-round. Americans can now find most of these bread products at grocery stores as well as at local bakeries. Challah, also sometimes spelled "hallah," is a braided bread traditionally eaten on Jewish holidays. The bread remains widely popular in Europe and the United States. Challah dough typically contains eggs and honey. Bakers divide the dough into three ropes and braid it into one loaf. The bread gets its golden color from a mixture of egg or butter brushed onto it before or immediately after baking. Matzoh, also sometimes spelled matzah or matzo, is an unleavened bread served during Passover as a substitute for leavened bread. This thin, crispy bread traditionally contains only white flour and water. Matzoh closely resembles unleavened breads made in Southeast Asia, such as the Indian breads chapatti and roti. A bialy is a chewy yeast breakfast roll similar to the bagel, but with a depressed center instead of a hole. Bakers typically brush the bialy with onion flakes before baking. The word “bialy” comes from the Yiddish word “bialystoker,” meaning one who lives in Bialystok, a city in Poland. The bialy became popular in the United States in the late 19th and early 20th centuries when Russian Jewish immigrants began marketing the rolls. A bagel is a chewy yeast roll baked in the shape of a doughnut. Bakers traditionally boil the bagel dough briefly before baking, giving the bread its chewy, golden crust. 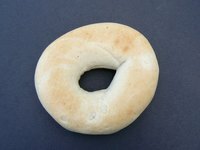 Many journalists and writers have studied the bagel’s origins and history. In 2008, an entire book devoted to this subject appeared: Maria Balinska’s “The Bagel: The Surprising History of a Modest Bread.” Common legend says that the bagel was invented in Poland in the 16th or 17th century. The bagel became popular in the United States in the early 20th century when Eastern European Jewish immigrants introduced the product. Frozen bagels appeared in grocery stores in the 1960s, though many people claim these products bear little resemblance to fresh-baked bagels. Jewish Recipes: What is Challah?